In a summer filled with blockbusters, it's a pretty tall order to stand out from the pack. Being a fifteen-foot tall green behemoth sure helps, though. The Hulk is one of the most anticipated films of the summer and should continue Marvel's winning streak for its film adaptations. It's set to make its competitors green with envy as it smashes box office records. 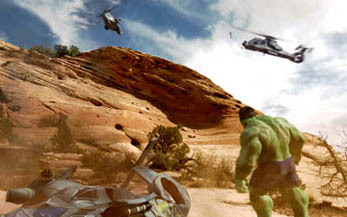 When the dust of the summer movies clears, Hulk could end up the biggest one there is. It wasn't too long ago when Marvel comic-book adaptations were a joke of the industry; with dismal flops such the Dolph Lundgren version of The Punisher, the 1991 version of Captain America (not to mention the never-released Roger Corman version of The Fantastic Four) and the years-long struggle to sort out the mess of the rights to Spider-Man, they wasted a lot of years and let rival DC Comics corner the market with its superheroes. After turning a corner with 1998's Blade, Marvel was able to take a little more control over its own projects and broke out big time with X-Men, opening that movie to $54 million in 2000. Of course, the real breakthrough was last summer's Spider-Man, which destroyed all expectations, spinning a web around theater patrons to the tune of $114 million opening weekend. Clearly, these characters have become important cultural touchstones that when done well, can be tremendously popular. Even the much less popular and more mediocre Daredevil was able to open to over $40 million and earn over $100 million domestic. The Hulk is actually one of Marvel's few pre-1990s successes in alternative media, with the very popular The Incredible Hulk TV series in the late '70s and early '80s. The Bill Bixby/Lou Ferrigno-starring series is still fondly remembered if fairly campy by today's standards, but it represents a character that people love. Like most of the enduring characters, Hulk is far more than a one-note caricature. In the way that Spider-Man is about maturation and responsibility, Hulk is about rage and the seduction of power. Naturally, you need a top-flight director to bring these issues to life, which has certainly been done here in the person of Ang Lee (hopefully he's faired a little better than the other Oscar-nominated director to release a summer blockbuster this month, John Singleton of 2 Fast 2 Furious). His choosing this assignment was a bit of a head-scratcher as a follow-up to Crouching Tiger, Hidden Dragon but it can only be good for the film to have a director willing and able to explore the more complex issues of what otherwise could be a flat exercise. Again following the Spider-Man model, the cast is comprised of up-and-coming leads and very well respected character actors in the supporting roles. Playing The Hulk's human alter-ego Bruce Banner is Eric Bana, an Australian import best known either for a role in Black Hawk Down or the lesser-seen but haunting prison bio Chopper. Oscar-winner Jennifer Connelly plays the love interest and gives foundation to the film. Sam Elliott and Nick Nolte round out the major portion of the cast. Let's be honest, though, we're mostly interested in the Not-So-Jolly Green Giant. Despite his pleas, we really do like him when he's angry. This brings us to the much-debated CGI Hulk. Fans were sent into a near panic in January after a Super Bowl commercial that some felt was far from convincing. This seems to be more a product of an FX savvy audience and a hypercritical target market than anything else. Reviews have pegged the CGI work as some of the best ever completed (let's face it -- we're talking about a giant green monster. It's not supposed to look realistic) and there has probably been some improvement over the last five months. Most of the grumbling has dwindled out, with anticipation rising once again. With a combination of impressive action and effective drama, Hulk could be a tremendous audience pleaser. First place at the box office is not at all in question, but just how big can Hulk get? The current June opening weekend record of $54 million held by Austin Powers 2: The Spy Who Shagged Me is about to become a memory. Even the inflation-adjusted June record of $70 million held by Batman Forever looks as though it is in jeopardy. The best recent comparisons for Hulk are, of course, the past few Marvel adaptations, with Spider-Man and X2 being in the same strata. While perhaps not on the same level as the webslinger, the singular focus of The Hulk gives it a slight edge over the splintered storylines of the X-Men, allowing a little better identification for audiences. Hulk should pull a massive $88 million for Universal this weekend, leaving Finding Nemo and the rest of the top ten seeing green. This will also make Universal's third straight $50 million opener, a tremendous feat considering the upcoming release of American Wedding. In a vain attempt at counter programming, Warner Bros launches Alex and Emma, starring current It Girl Kate Hudson and the less exciting Wilson brother, Luke. Loosely (very loosely) based on Dostoyevsky's The Gambler, it's really another Rob Reiner schlock-fest (how far Reiner has fallen -- with two of the greatest comedies ever under his belt, This Is Spinal Tap and The Princess Bride, you'd expect him to be able to recapture some of that magic in the last 16 years). Wilson is a writer with a gambling problem who has literally put his life on the line for his work; unless he finishes his latest novel in 30 days, he'll be killed by Cuban mobsters. Me, I'd just get a more lenient editor but he decides to hire himself a typist to help him out, in the form of Hudson, who starts to imagine both of them as the characters in the romantic novel he's writing. Flashbacks and hijinks ensue. Clearly, the gambling-addicted novelist who makes bad decisions is really the one for her. Really, Alex and Emma is far too convoluted for a simple romantic comedy and even though Kate Hudson is coming off the spring success of How to Lose a Guy in 10 Days, this movie is a step backwards for her. The commercials aren't especially funny or moving (or even in rotation) and Luke Wilson, though likeable, is no special draw. It's basically been lost in the Hulk Hype, and WB hasn't really pushed the issue either. When Harry Met Sally 2 this ain't. Look for a middling $13 million on the weekend. The Razzies can pretty much close their ballots after this weekend, as it'll be tough to top the third new film of this week for sheer hackwork and hubris. From Justin to Kelly, "starring" the winner and runner-up of the first season of American Karaoke... I mean American Idol, is a transparent and crass attempt to squeeze out one more dollar out of a tired and overexposed entertainment regime. This ploy wouldn't even be such a bad thing if they actually managed to make something worth watching, but the end result looks like they put about five minutes total into the concept, plotting and writing of the film. Totally stealing Frankie Avalon and Annette Funnicello's bit, From Justin to Kelly strands the two on a beach resort doing what all young people do on vacation; perform elaborately choreographed pop song and dance routines and find themselves in vaudeville-like pratfall comedy set-ups. Even the lamest "Must See TV" NBC sitcoms don't stoop this low for entertainment. Time and time again has shown that just because audiences are interested in people in one setting, it doesn't mean they'll follow to all others (hence the Friends "curse"'). Fox has severely misjudged the American Idol fans' loyalty when the buzz was really all about the show's format. At the very least, winner Kelly Clarkson's album has gone platinum, but runner-up Justin Guarini's album sold a dismal 57,000 copies in its first week, showing that there's only so far in-your-face marketing can take you. To the studio's credit, Fox realized relatively early in the game that it had a loser on its hands and cancelled nearly all advertising for the film, not producing a theatrical trailer and cutting out all preview and press screenings completely. I'm sure the suits involved would like to pretend it never existed, though they don't deserve to get let off the hook that easy. The laughing stock of the summer, the only audience left now for this is the hopelessly addicted (clearly not many), the pre-teen crush crowd and the rubberneckers looking for an ironic experience. With a 2,001 venue release that smacks of contractual obligation, it should probably be enough for a merciful $5 million weekend and hundreds of jokes for next year's Oscar host. Still running very strong among returning films is Finding Nemo, which recaptured first place last weekend though it is ceding it to The Hulk this frame. This fishy adventure is now the third best earning Pixar film ever, having passed Toy Story mid-week on its way well past $200 million. The $255 million of Monsters, Inc. may very well fall within the next few weeks at this rate; this accomplishment has to be seen as at least a mild upset. With a much less star- studded cast and the untested May opening, there was much that could go wrong that could have left Pixar with a failure. Instead, their winning streak continued and improved. Perhaps they really can do no wrong. With a ridiculously steep drop off in its second weekend, 2 Fast 2 Furious is quickly becoming one of the shortest-lived sequels ever. Falling a full 63% from opening weekend, 3 Fast 3 Furiouser seems to be ruled out of the picture. With a glut of blockbusters on the horizon, those 3,100 plus screens are going to be easily tempted to dump this lame-brained glorified car commercial. Look for only about $7 million this weekend, an 85% drop in just two weeks. Competing for biggest drop-off with that film will be Dumb and Dumberer, which managed to lose steam even through the weekend. This pointless sequel will be best served by being melted down for its silver content but a quick exit from theaters is a good compromise. The other two new films released last weekend, Rugrats Go Wild and Hollywood Homicide, will fare better but neither has shown above average staying power. This trio will end up in the $4 to $7.5 million range. It's a banner weekend for comic-book fans, who finally get to see one of their heroes come to life. Their collective breaths are held, though, waiting in judgment as to how well the adaptation has been done. It's the biggest game in town by far with high expectations to be met. That just means the potential payoff is even larger.